We produce for Italy and abroad i giocolosi by stefano laghi. Italian leaders of silicone moulds, we create and sell for over 10 years i giocolosi by stefano laghi, food safe silicone moulds worldwide to confectioners, bakeries and Delicatessens. 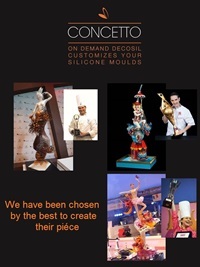 The new line of moulds "I GIOCOLOSI" has been developed and signed by Pastry Chef Stefano Laghi. The name "GIOCOLOSO" is made up of two Italian words: “gioco” which means “a game, fun” and “goloso” which means “delicious, gourmand”. Once you choose the HEAD of GIOCOLOSO with your favourite face you can choose a matching BODY KIT. Every kit contains MOULDS suitable for making interchangeable body parts and could be assembled in various combinations. the TORSO, the ARMS, the SHOES and the BASE. The moulds for the TORSO and the SHOES are different in each kit and allow you to choose the GIOCOLOSO’s cloths. The ARMS are interchangeable and the BASE is used as a support for a GIOCOLOSO character in order to fix it in different positions (standing, sitting, lying etc.). What better opportunity for such a unique present! The GIOCOLOSI will be a perfect alternative to the traditional Easter egg. Their egg shaped body will make them suitable for this occasion to the children's joy.